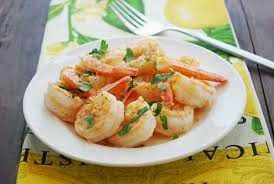 I make shrimp all the time, but this recipe really tasted yummy – very lemony. Love the addition of fresh thyme and shallots to the mixture as well. The shrimp burst with flavor. Season shrimp with salt and pepper. Melt butter with 2 Tbsp. olive oil in a large skillet over medium-high heat; add shrimp, thyme, and next 2 ingredients, and sauté 2 to 3 minutes or just until shrimp turn pink. Add lemon juice and parsley.